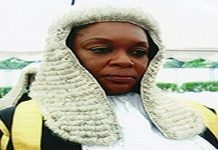 JUSTICE Mojisola Olatoregun is not happy with the reason given by Musiliu Obanikoro, star prosecution witness in the trial of Ayodele Fayose, former governor of Ekiti State, for not appearing in the court today. Rotimi Jacobs, prosecuting counsel for the Economic and Financial Crimes Commission, SAN, told the judge that Obanikoro, who testified in the court on Tuesday had been hospitalised. He stated that Obanikoro was sick and presented a medical report from an Ikoyi hospital to back is claim. 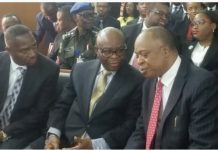 But receiving the report with misgivings, Justice Olatoregun said it had better been genuine or the hospital and the doctor that issued it risked the loss of their licences, if the court verified the report and it was not genuine. Because of Obanikoro’s absense, the N2.2bn fraud trial of Fayose, was stalled on Thursday. “He must present himself before the court on the next adjourned date or be compelled to do so,” Olatoregun said.